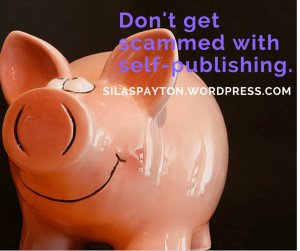 There have been a lot of numbers thrown around lately about the cost of self-publishing. These range from zero to thousands of dollars. I was recently inspired to do a post on navigating though some of the costs of putting a book out, and what might be considered reasonable. A couple of months ago I was encouraging a new writer to self-publish a book he had just finished. I gave him a few websites to check out and left him to investigate. This almost cost him a bundle, for which I would have felt terrible. I had left out one piece of very important advice: be careful. After running a small business for almost twenty years, the most important thing I’ve learned — and self-publishing is running your own business — is to keep your expenses low. Next Next post: When technicalities get in the way.